As some readers of my blog may already know I love trying out new foundations. I like to mix different formulas together, until I will find a perfect coverage and finish. I am a big fan of medium coverage foundation and dewy finish. The Vichy Dermablend is a high coverage foundation, it's also very matte. Also it's dries really quick, so you need to work quite fast with it. I would compare it to heavier version of Estee Lauder Double Wear, but for cheaper price. I do really like it, but not on it's own, as it's just too matte on the skin, I been experimenting and mixing it with other foundations. 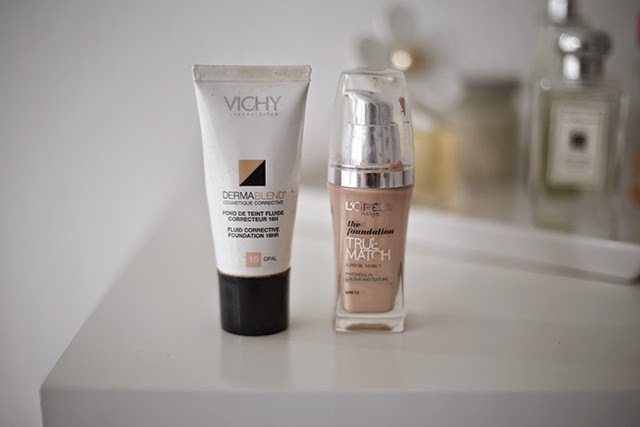 My favourite combination is L'Oreal True Match mixed with the Vichy Dermablend, the True Match is a lot more lighter and watery in the formula. I used to really like it on it's own, but currently my skin have been playing around and I just wanted much more higher coverage. What I love the most about the mixture is that it's last on my face pretty much for the entire day. The colour match is also great for my pale skintone. Have any of you have experimented with mixing foundations? What's your favourite mix? I use the same mix, haha! It's great!